Hopefully you have managed to move all your electrical equipment high enough not to get wet. For All-in-one devices such as ipads, Apple imac or HP Omni its best to take it into a computer shop as they are complicated to open and you may damage it more. If you have valuable data on your hard disk, which is not backed-up elsewhere then we recommend that you remove the hard disk and get it checked by an expert. 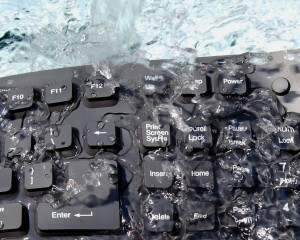 If you have a hard disk that has been submerged in water then DO keep the hard disk WET. Ideally, keep the hard disk drive in a sealed container to keep the hard disk drive wet. This stops the hard disk drive corroding and allows the technical staff at the recovery company to clean and dry the platters correctly with minimum damage to the platter surfaces. That should get you to the point where you now know what is broken and what is not.